Eglinton Grand ‹ Rovey Banquet Services Inc. Formerly The Eglinton Theatre, this historic landmark has been restored to its original 1937 grandeur! Recapture the elegant design and sophistication of this majestic facility. Boasting one spectacular ballroom, the venue is exclusively yours for the evening. Holding true to its art deco décor, The Eglinton Grand is adorned with rich woods including mahogany and ebony, elegant marble, beautiful wainscoting and period furniture. The balcony level will create an ideal private cocktail area. The venue can host dinners from 100 to 530 and receptions for up to 1000 guests. The ballroom features intelligent state of the art sound and lighting. The facility is wheelchair accessible. The venue can host dinners from 50 to 550 and receptions for up to 1000 guests. The Gallery at the Eglinton Grand is an intimate ceremony room, seating up to 220 people. The room boasts skylights over an elevated ceremony area. Its art deco decor perfectly compliments the style of the main ballroom. Whether you are having your reception at the Eglinton Grand or are simply looking for a distinctive venue to hold your ceremony the Gallery can be transformed to meet your needs. We feature many amenities that will make your event memorable such as a bridal room and the option of having your ceremony on site. 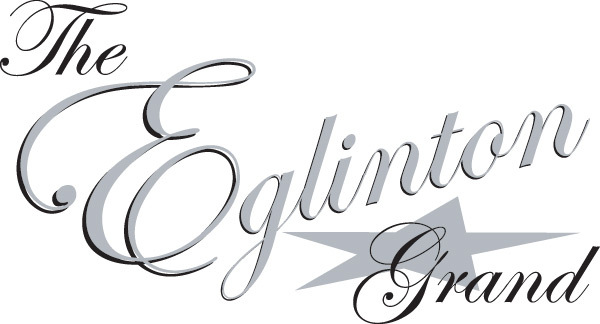 The Eglinton Grand is a full service facility providing exceptional food and service meticulously executed by its professional staff. Unlike like most landmark facilities, clients will find everything under one roof, making hosting an event at The Eglinton Grand worry free. Venue rental includes catering staff and bartenders, tables, custom designed art deco banquet chairs, Royal Doulton china, cutlery, glassware and white floor length linens and napkins.